During his heyday, nobody brought the heat better than “Marvelous” Marvin Hagler. He fought with an aggressive, take no prisoners kind of style that made for some classic battles. Anyone synonymous with Marvin Hagler had to be a special fighter and that was the case with former featherweight champion Freddie “Lil Hagler” Norwood. Norwood was similar to Hagler in many ways. He sported a shaven skull and inside the ring he was a southpaw who was an offensive machine. He loved to come forward and put together hard combinations to the body and head without much fear of what was coming in return. Norwood was born and raised in Saint Louis, MO which has a well known legacy for boxing as it produced three heavyweight champions in Sonny Liston and the Spinks brothers, Michael and Leon. Norwood would turn pro in August of 1989 and would go 26-0-1 with 18 KO’s over the next eight years, which included a win over future, long time super bantamweight champion Vuyani Bungu. It was in 1997 that the boxing public began to take notice of Norwood. On 07/13/97, Norwood would make his national debut on CBS, taking on tough and rugged journeyman Darryl Pinckney. 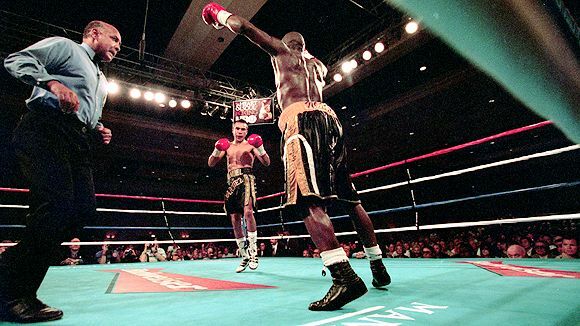 It would be one of the last bouts fought on CBS in the 1990’s. Prior to the bout, the legendary trainer and commentator Gil Clancy highly praised Norwood and felt he should be in line for a world title. Inside the ring, Norwood dominated Pinckney in spectacular fashion as he won a 10 round unanimous decision. During the post fight interview, he called out Vuyani Bungu, who was a super bantamweight titleholder at the time. Norwood would follow this performance up with another exciting performance over Agapito “Cyclone” just one month later. He then called out another Jr. featherweight champion in Junior Jones. The major titleholders at 122 and 126 lbs weren’t responding to the challenges called out by Norwood, however he would finally get a shot at a world title when he faced former super bantamweight titleholder Antonio Cermeno. They met on 04/03/98 at the Coliseo Ruben Rodriguez in Bayamon, Puerto Rico and it was for the WBA featherweight championship. Norwood dominated Cermeno from start to finish as he won a lopsided unanimous decision. After nine long years, Freddie Norwood was finally a world champion. He would make his first defense of the title just two months later on ABC’s Wide World of Sports as he would dismantle very tough Nicuraguan challenger Genaro Rios in eight rounds. After the KO victory, Norwood began calling out “Prince” Naseem Hamed, saying “Come on Princess, let’s fight”. Hamed didn’t answer the call, so Norwood continued to fight on as he successfully defended his title four times over the next year. Norwood would then make his HBO debut in 1999 as he took on future Hall of Famer Juan Manuel Marquez of Mexico. They met on 09/11/99 at the Mandalay Bay in Las Vegas, NV. On paper, this fight was guaranteed to be a barn burner, however it was far from it. The fight was a rough, ugly “stinker” in which neither fighter really got anything going. The end result was a controversial, unanimous decision win for Norwood. “Lil Hagler” bounced back at the start of the new millenium with two impressive defenses of his title over unbeaten challengers Takashi Koshimoto and Julio Pablo Chacon. On 09/09/00, Norwood took on Derrick “Smoke” Gainer on a big Pay Per View card at the New Orleans Arena in New Orleans, LA. Norwood was unable to make the contracted weight for the bout and it was one of the first times that a title was lost on the scales. Inside the ring, the fight was an all action slugfest that had just about everything from knockdowns to low blows. The referee Paul Sita made some unusual calls as he administered counts for low blows as well as counting during an instance when both men went to the canvas while tying each other up. Norwood would lose by 11th round TKO in unusual fashion as Gainer put Norwood down with a series of low blows after Norwood hit him with a series of low blows. After this bout, Norwood began having legal troubles outside the ring as he was arrested and charged with both kidnapping and assault. He would remain out of boxing for six years and would make a comeback in 2006 going 5-3 from 2006-2011. His record as a professional stands at 43-4-1 with 23 KO’s. Who knows what could have happened in those six years he was away from the ring. Could he have bounced back and won more world titles and faced off with the likes of Marco Antonio Barerra, Erik Morales and Manny Pacquiao? Instead all we are left with is the memories of a very tough and skillfull fighter who didn’t live up to his full potential.